How can we maximize limited outdoor recreation space? PlayWebTM by Playworld Systems allows for big play in small outdoor spaces. 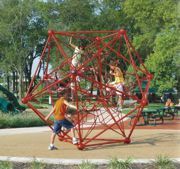 Available in three sizes and designed like a jungle gym, PlayWeb's multi-leveled climbing system suspends users above ground as they make their way through a maze of rope and steel tubing. The structure's vertical volume gives children nearly three times the play space of center-mast rope structures of the same height, minimizing required surface area while maximizing fun. We want to provide shade to attract people to our parks and pools, but most shade canopies are too difficult to remove and re-attach. Shade Systems is the only manufacturer of outdoor shade structures offering the patented Turn-N-Slide® easy canopy removal and re-attachment system. Standard on all Shade Systems frame-supported shade covers, the Turn-N-Slide makes it easy to quickly remove and re-attach the canopy in case of severe storms or winter weather. Ten-year fabric warranty. How can we provide skateboarders a place to skate? Consider building a "skate spot" or "skate dot": a simple skate feature, bench or grind pad designed and built for skateboarding. They can be installed in an existing park on a widened pathway or pad without huge construction costs or reconfiguration of an entire park. Skateboarders skate in public areas because that's where good skate features exist. Put these features in places where skateboarding is legal and desirable. We need bleacher covers that provide spectators with comfort in the hot sun and protection from foul balls. Apollo Sunguard's shade structures are the solution. The breathable fabric allows air to pass through, providing shade that reduces temperatures up to 20 degrees and blocks 97 percent of ultraviolet radiation. Plus, the foul-ball protection creates an attractive and cost-effective added benefit. Apollo Sunguard's shade structures are engineered for 120-mile-per-hour winds with the covers on. We need a movable solution for our filtration needs. Recreonics portable vacuum filters feature a stainless-steel cartridge filter, thermal plastic pump, waterproof switch and pre-wired GFI protector, 1.5-inch suction and discharge connections and 50-foot electrical cord, all mounted on a stainless-steel cart with heavy-duty rubber wheels. Two models include a 1-horsepower pump with 105-square-foot filter to filter over 5,525 gallons per hour, and a 2-horsepower pump with 155-square-foot filter to filter over 8,000 gallons per hour. Our pool is showing its age with cracking and crumbling concrete. How can we reduce our yearly maintenance costs and stop shutting down our facility for six weeks of maintenance? Natatec PVC Pool Lining turns old, deteriorating pools into beautiful, low-maintenance facilities within weeks, not months. Natatec PVC lining saves on chemicals, water, heat and maintenance upkeep, and has a 10-year warranty. Three great colors to choose from in both slick surfaces and slip-resistant surfaces. How can we offer weight training in a small space? Smaller facilities can offer barbell training without investing significant revenue and valuable floor space with the new Power Systems10 Set CardioBarbellTM system and compact storage rack. Each set includes a standard 48-inch steel bar with a durable PVC-coated grip, two 10-pound, two 5-pound and two 2 1/2-pound rubber-encased plates and one pair of spring collars. The space-efficient storage rack provides easy access to all barbell components. I thought stainless steel wouldn't show rust or buildup. How can we clean rust and buildup from stainless-steel components? Stainless steel is a corrosion-resistant alloy, but it may display rusting characteristics under certain conditions. Routinely wiping down rail surfaces and rinsing with unchlorinated water minimizes the potential for corrosion. In the event stainless-steel equipment displays rust stains or deposit buildup, specialized materials are needed. 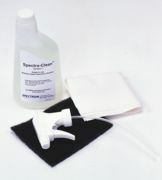 The Spectra-CleanTM stainless-steel cleaning kit includes all of the materials needed to safely clean numerous stainless-steel products.